Heists and casinos seem to go hand in hand and BetSoft have aimed to capture a bank heist in this real money pokie game. Whether or not the popular software developer, renowned for 3D graphics, has pulled it off is another question, so we have decided to enter the criminal underworld to find out. The Heist follows the story of a professional bank robber, Neil Quayland, who is being tracked down by a detective, Albert Kowalski, all the while planning his biggest heist yet – a $9 million job. BetSoft never disappoint when it comes to storylines, and execute them well with 3D technology and exciting animations. You can watch the intro to get the details of the story, with it almost feeling as though you are watching a real Hollywood blockbuster. The pokie features 5 reels and 30 paylines, and coins range from 0.02 up to 1.00, with a minimum of one coin per line and a maximum of five coins per line available. Heist has been optimised for BetSoft’s ToGo series meaning you can tap our links to access the title on the go. Apple, Android, Windows, and other mobile devices are compatible to play Heist with, for real money. The sound effects commence once you click spin, and the intense audio ties in well with the theme. Mute the audio in the top left hand corner if it is too much for you. The low paying symbols include the stopwatch, the security keypad, and the blueprints of the vault, with the best possible payout set at 100 coins by spinning five blueprint symbols. The middle paying symbols includes the gun, the bag of money, and the close up of a bank note, with the best payout here set at 250 coins, by spinning five bank notes. The highest paying symbols out of the standard symbols includes the bag of diamonds, the detective, and Quayland himself, with the highest possible payout here set at 500 coins by spinning five Quayland symbols. Scatter symbol: The Scatter symbol is the the drill symbol and interestingly it doesn’t trigger any Free Spin features here. Instead it sees a payout in accordance to the number you spin, with three Scatters paying 150 coins, four paying 300 coins, and five paying 750 coins. Wild symbol: The Wild symbol is the C4 symbol and when it lands on the centre of the middle reel, the entire reel explodes and turns Wild, with a 2x multiplier applied. Bonus symbols: There are two bonus symbols to trigger their corresponding bonus features including the vault symbol, and the glass cutter symbol. You need three of each to trigger their corresponding features. There are two extra bonus features to BetSoft’s Heist, with extra bonuses available to activate within the Glass Cutter Feature. Second Screen Bonus Round: If you spin at least three vault symbols you will trigger the Second Screen Bonus. Here, you will be prompted to choose your mode of entry to the vault and then follow Quayland around it as he stashes cash into a bag. You will be alerted to when the detective has arrived and you need to decide when to escape before he catches Quayland, risking winning more or losing it all. The money Quayland escapes with is then credited to your account. Glass Cutter Feature: When you spin at least three glass cutter symbols you will trigger the Glass Cutter Feature where you will be able to pick one of the symbols to win an instant prize, free spins (wins are doubled here), or a free bonus credit win. 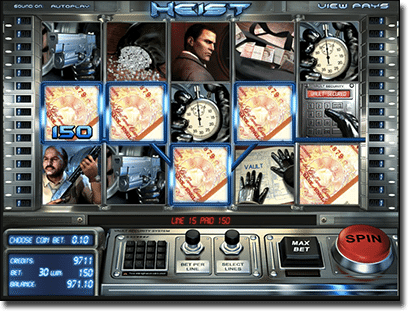 Heist is the perfect theme for a pokie, provided the software developer executes the storyline well – and that’s exactly what BetSoft have done. The detailed video intro and the 3D graphics immerse the player into the story and the bonus features are quite exciting, unique, and generous. 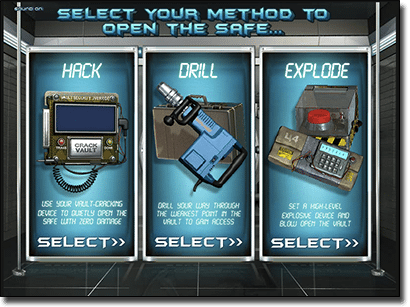 The main bonus feature where we get to decide how to enter the vault – we chose explosives of course – and when to escape without being caught adds a thrill element to the bonus features, rather than just clicking to win. However, the click to win with the chance to win free spins, or instant credits is also just as exciting. Overall, Heist is an incredibly fun pokie and if you’re into action-packed blockbusters, you’ll get your money’s worth here. Play Heist at our favourite pokies-only online casino, www.SlotsMillion.com. There are over 1000 pokies available here, and you can get up to $100 matched by 100% if you click our links and sign up as a new player.